Diane Gutierrez-Scaccetti was confirmed as the 19th Commissioner of the New Jersey Department of Transportation on June 7, 2018. Governor-Elect Phil Murphy nominated her to be Acting Commissioner on December 19, 2017 and she began serving in that capacity when Gov. Murphy took office on January 16, 2018. A native New Jerseyan, Ms. Gutierrez-Scaccetti is a transportation professional with more than 28 years in the industry, and 34 years in government service. She possesses extensive executive, operational and planning knowledge. Most recently, the Commissioner served as the Executive Director and CEO at Florida’s Turnpike Enterprise, a part of the Florida Department of Transportation. Under her leadership, Florida’s Turnpike Enterprise managed more than 460 centerline miles and a 5-year capital program in excess of $6 billion, supported by $1 billion in revenues. This capital program included the construction of SunTrax, a 2.25 mile test track and research facility for the development of transportation technology, including automated and connected vehicle applications, and managed lanes within the Turnpike System. SunPass, Florida’s statewide electronic toll collection system, was under her charge. As Executive Director and CEO, she was a member of the Executive Committee of the Florida Department of Transportation, a policy setting body that reports to the Secretary of Transportation. Prior to the Commissioner’s Florida experience, she spent 21 years at the New Jersey Turnpike Authority, working her way up from a Contract Administrator to the post of Executive Director, a position she held from 2008 to 2010. During her tenure, she managed the day-to-day administrative operations and was chief negotiator for the agency’s several collective bargaining units. Ms. Gutierrez-Scaccetti participated in several major agency initiatives, including the remediation of the E-ZPass System, the financial and operational consolidation of the New Jersey Turnpike Authority and New Jersey Highway Authority, bringing the New Jersey Turnpike and Garden State Parkway under a single organization. A major undertaking was the development and financing of a 10-year, $7 billion capital program that kicked off the widening of the New Jersey Turnpike from Interchange 6 to Interchange 9. This transformational project provided significant congestion relief to a major portion of the I-95 Corridor. The Commissioner’s accomplishments and leadership have been recognized by the Executive Women of New Jersey, WTS Central Florida Woman of the Year, and Orlando Business Journal’s 2015 CEO of the Year for the Public Sector. 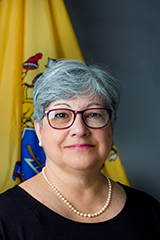 Commissioner Gutierrez-Scaccetti holds degrees from the University of Connecticut (BS) and Rutgers, The State University of New Jersey (MS).